No, this is not the same Vega 10 you have in RX Vega 64. We need to differentiate the names now. The Vega 10 is a GPU codename for the desktop graphics card, Radeon Vega 10 is a mobile graphics codename. The confusion does not stop there. The Ryzen 7 2700U comes with an integrated graphics solution codenamed Radeon Vega 10 Mobile. According to the OpenCL manifesto, this solution has 8 Compute Units (512 Stream Processors). 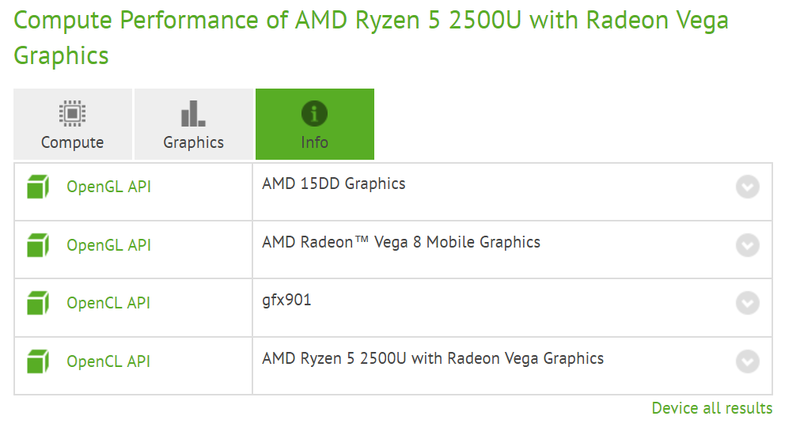 Meanwhile, the Ryzen 5 2500U comes with Radeon Vega 8 Mobile, which also has OpenCL information, but with more compute units. According to the listing at GFXBench it actually comes with 11 CUs, which means 704 Stream Processors. This number is quite odd, it’s also hard to understand why would Vega 8 have more cores than Vega 10, but well, this is all the information we have right now and it may not be accurate. The Ryzen 2000 series are the first installment of Ryzen Mobile, which is expected to arrive later this year. The parts listed here are APUs (CPU+GPU).